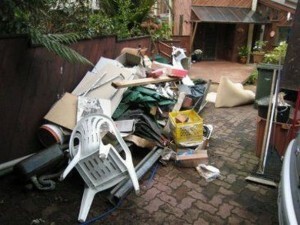 Are you looking for help with garden clearance in Poplar E14? We have the ideal solution! For nearly 15 years we’ve been providing garden clearance Poplar locals trust in and enthusiastically recommend to neighbours, relatives and colleagues. They really like our speedy, flexible services and budget friendly prices. And we believe you will too! 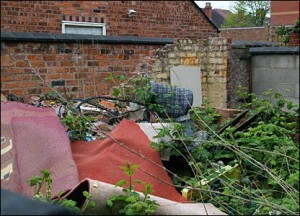 Garden clearance is hard work and getting rid of large quantities of garden waste is often a big problem. At Away With It we make the process as simple and hassle-free as possible. With our fast, flexible and surprisingly affordable service all of your garden refuse will be cleared in no time. And you won’t have to lift a finger! Outdoor storage sheds, coal bunkers, greenhouses, water features and other hard landscaping items. And we will sweep and rake up when the job is completed, leaving your garden neat and tidy. We are insured and fully licensed. You can rely on us to carry out a completely professional job and deal with all your waste safely and dispose of it responsibly. We work 7 days a week from 7am to 11.30 pm. Evening and weekend appointments can always be set up for your convenience. We supply a quick, on demand removal service. Any time you need us we are just a telephone call away. Reservations are in two hour slots and we’ll always call in advance confirm you know when we’ll be getting there so you’re not left hanging about. Our clear pricing means there won’t be any unpleasant bombshells when the job is completed. The rate we quote is the rate you will pay without hidden extras. We always sweep up when we’ve finished removing your refuse and leave your house neat and clean. To discuss your requirements for garden clearance Poplar call us today on 0208 504 7390. We’re here and ready to take your call 7 days a week from 7am to 11.30 pm. Our expert team will be pleased to answer your questions and offer a competitive free estimate. Or you can submit your details using our quick and easy request a quote form and we will answer you fast.